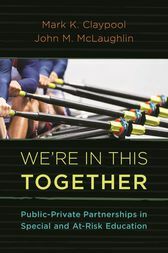 We’re In This Together: Public-Private Partnerships in Special and At-Risk-Education is a timely book that explores the use by public schools of private education companies to meet the needs of some of the nation’s most challenged and challenging students. The book examines variations of use by states as well as the cultural attitudes toward the private sector to address these core functions of public schooling. The book offers grounded and thought provoking perspectives on: the legal framework of PL94-142 and its successor IDEA; the disconnect between the needs of young children with autism and public school special education services; and the significant size of the at-risk population and the shortcomings of efforts to serve those students. Written as qualitative research in the form of ethnographic participant observation, key sources in the literature are cited and four dozen knowledgeable people in positions of significant authority are interviewed on the interface of public education and the private sector in special and at-risk education. A foreword is provided by Barbara Byrd Bennett, CEO of the Chicago Public Schools. Considering the need to close the gap between cost of delivery and certainty as to effectiveness of solution for the exceptional learner, Mark Claypool and John Mclaughlin have taken on the oft-ignored but important support layer of private-public partnerships in the USA. There are no two more experienced curators of relevant and pragmatic information on this topic, which should be required reading for professionals and parents of up to 20% of the national student population. Mark Claypool is president and CEO of Educational Services of America (ESA), which he founded in 1999. Prior to forming ESA, he held various positions in both state government and the private sector in mental health, juvenile corrections, and education. Today, ESA is the nation’s leading provider of behavior therapy and alternative and special education programs for children and young adults. John M. McLaughlin, PhD, is an executive vice president and the director of research and analytics for Educational Services of America (ESA). He has been with the company since 1999. Prior to joining ESA, McLaughlin founded Benton Hall School in Nashville (1977), was a tenured professor of educational administration at St. Could State University in Minnesota (1988–1998), and wrote monthly on education reform via The Education Industry Report (1993–2000).